Marcus Rose appeared on Show 222, recorded in November 2010, at age 17. Marcus Rose (viola), 17, hails from Shreveport, Louisiana where he’s a senior at Caddo Magnet High School. He studies viola with Borys Smolaga and also plays the piano. 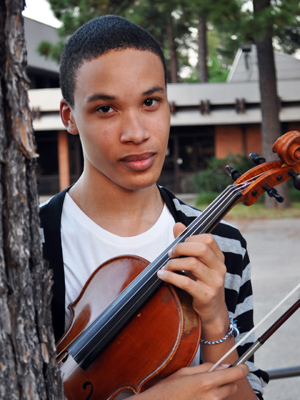 Marcus is a member of his church choir, plays with the Marshall Symphony, and is part of the American String Teacher’s Association National High School Honors Orchestra. He has taken master classes with the Manhattan String Quartet and participated in the Sewannee Summer Music Festival. Marcus is a recipient of From the Top’s Jack Kent Cooke Young Artist Award In his free time Marcus likes to hang out with his friends, shop, and play The Sims 3 on his computer. Marcus is a Jack Kent Cooke Young Artist.